Property located across the beach. The owners Miriam and Javier were the best. New building with all the amenities you want: wonderful endless pool, jacuzi and sauna. 24 hours security. is decorated in very good taste; all the furnishings and details are first rate, as well as the bed and linens. Close to old city. Cartagena is a beautiful place. Will be back, for sure! First of all I have to Thank Myllo for being a Super Host. I rented this flat for my parents and my brother who live in the coffee region of Colombia and were to go to spend time in the Colombian Caribbean. Myllo was very good at communicating with me and then directly with my parents who stayed at her flat in Morros City. They loved the place as it looks as it is in the photographs and in the video. Location is great and the swimming pool and jacuzzi were too. The Flat is comfortable as well. Once again, Thank You Myllo for taking care of the details and for ensuring guests have a great experience at your place in Cartagena. Great view, nice pool, moder room. Owner very friendly and funny! La vista del apartamento, es uno de los detalles que mas me gusto se puede ver la playa, el atardecer, la ciudad amurallada y la piscina del conjunto. La limpieza del sitio y las atenciones de la anfitriona, también fueron excelentes. Los detalles muy bien cuidados en el apto, todo muy bien pensado para la comodidad del visitante. El departamento es magnífico, muy nuevo y bien equipado. Estabamos en el piso 30 con una vista muy linda al mar y toda la bahía. Para llegar al centro histórico es cómodo. 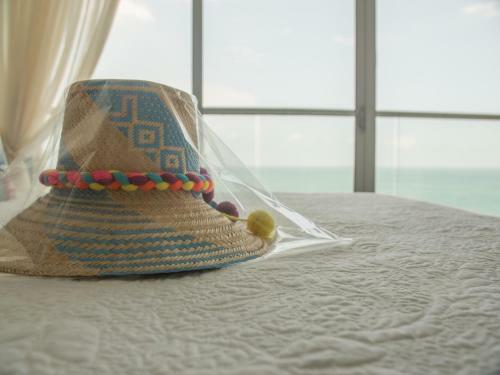 Lock in a great price for Luxury Alojamientos Namaste-Morros City – rated 9.8 by recent guests! Luxury Alojamientos Namaste-Morros City This rating is a reflection of how the property compares to the industry standard when it comes to price, facilities and services available. It's based on a self-evaluation by the property. Use this rating to help choose your stay! 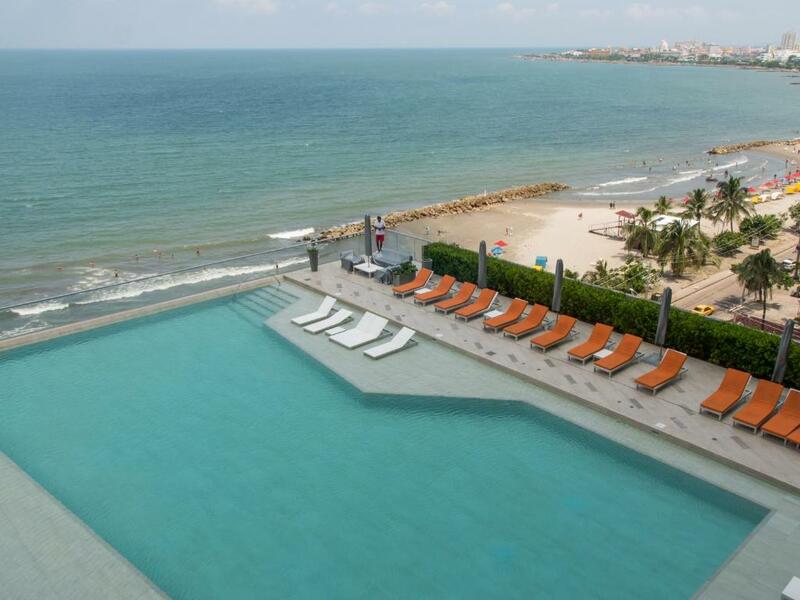 1.8 miles from Bolivar Park, Luxury Alojamientos Namaste-Morros City is located in the Bocagrande district of Cartagena de Indias. Housed in a building dating from 2017, this apartment is 1.9 miles from the Cartagena's Gold Museum and provides free WiFi. The apartment includes 1 bedroom, a bathroom, a seating area, and a kitchen. A flat-screen TV with satellite channels is available. Staff at Luxury Alojamientos Namaste are always available to provide advice at the reception. The accommodation offers 4-star accommodations with a hot tub and sauna. Luxury Alojamientos Namaste-Morros City has an outdoor swimming pool. Palace of the Inquisition is 1.9 miles from the apartment, while San Felipe de Barajas Castle is 2.1 miles from the property. Rafael Núñez International Airport is 5 miles away. When would you like to stay at Luxury Alojamientos Namaste-Morros City? House Rules Luxury Alojamientos Namaste-Morros City takes special requests – add in the next step! Luxury Alojamientos Namaste-Morros City accepts these cards and reserves the right to temporarily hold an amount prior to arrival. Please inform Luxury Alojamientos Namaste-Morros City of your expected arrival time in advance. You can use the Special Requests box when booking, or contact the property directly using the contact details in your confirmation. You get you "yellow" bracelet number and you may not ever take it off. Forget about any guests inside! Security like in prison.